“Nalan” means lotus (symbol of wisdom), “Da” means “to give”. So the word “Nalanda” means wisdom giver. For wisdom, people from the whole world came to Nalanda University and it became the first residential university of the world. At its prime time the university consisted of 10,000 students and 2,000 teachers from across the world. Let’s have a journey with the History. Ancient Buddhist source says that Ashoka, the great Mouryan emperor built a temple at 3rd century BC. 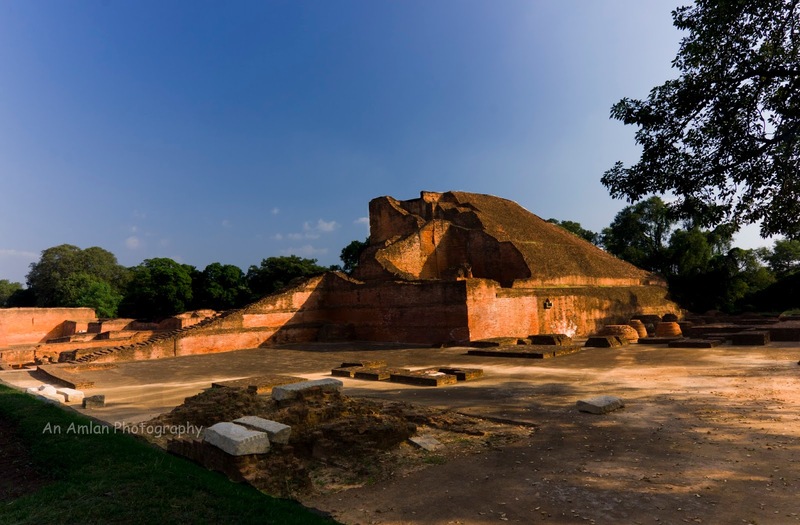 But according to Chinese traveller Hieu En Tsang and Prajnavarman, Nalanda University was founded on 5th Centrury AD during the Gupta emperor Kumargupta. Surprisingly Fa Hien who came in fifth century AD makes no mention of the massive establishment at Nalanda. But Hieu En Tsang (visited India on 637 AD) during Harshavardhana’s regime refers to the great university. Nalanda University flourished under Harshavardhana’s patronage. He made the university two storied and expanded it a lot. The great library was established in Harshavardhana’s regime. By that time students across the world started coming there for wisdom. Last, the university was backed by Pala dynasty. By that time the university was funded by the kings of different countries. Other universities like Vikramshila started giving a serious competition to Nalanda and both of them had a common network of exchanging students, professors and study materials. 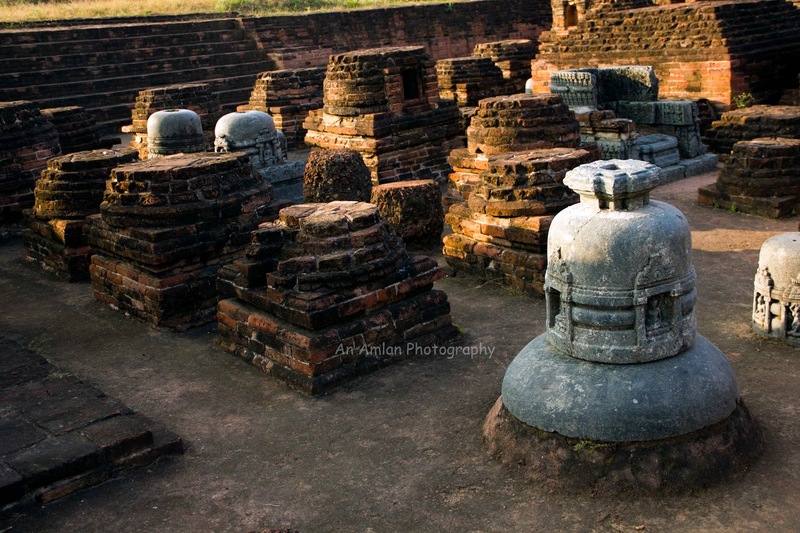 The structure of Nalanda was beyond all imagination. 11 hostels were there to accommodate 10,000 students; 3,000 residential rooms for professors. Debate room, temples, monasteries, library, meditation rooms were established for all. Not only from China, Tibet, Syria, Persia, Korea, Singhal, Java, Sumatra, Greece came here to acquire wisdom. This university had a strict and structured admission process. The students had to satisfy the gate keepers with his merit and intellectual vibes. The central library was nine stored and consisted of thousands of books and manuscripts. It is said that it took six months to burn it completely. 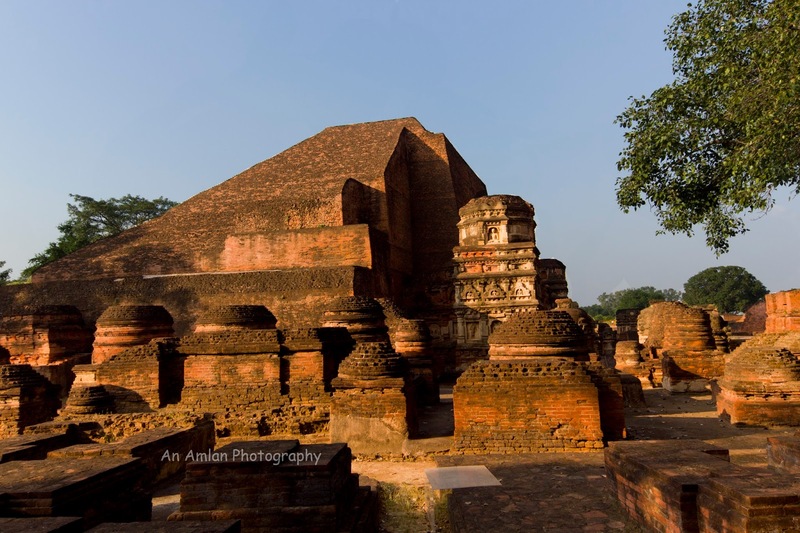 Decline of Nalanda started from 11th Century as the increase of the sabotage of Hindu religion and final nail in the coffin was done by Bakhityar Khilji who attacked the university with the conspiracy of Hindu kings and abolished it. A paradise was lost. After its unfortunate destruction the entire area got deserted and the complex went under deep forest. Even more surprisingly people soon forgot it. On 1820, British geographer Buchanan Hamilton visited Baragaon village and found some Hindu and Buddhist stone models, coins scattered over the place. On 1872, the great excavator of Archaeological Survey of India, Sir Cunningham started a pilot project to excavate. After his excavation, ASI annonunce the place as the university mentioned in Hieu En Tsang’s write up. Later on 1872 and 1915-1936, two excavations were performed by ASI in bigger way. After independence, in between 1974-1982 another round of excavation was organized. As you look into the above schematic map, 11 monasteries and 4 temples have been excavated so far. Some area has been marked to excavate in near future but most of the area cannot be excavated as they are under paddy land and villages. Excavation may cause an issue of huge compensation to the villagers. I would suggest the readers of the post to keep at least six hours for this place. Usually people used to visit for 2-3 hours. Tourist needs to feel the history and the greatness of it. As you first cross the main gate, you will find the Monastery 1, Monastery 1A, and Monastery 1B at the left. Walking down the lanes of Monastery 1, 1A, 1B you can see the student hostels. Each student had his own individual room. It seems like that the room consisted of a cot made by rock, wardrobe and place for keeping study materials. Walking down the lanes/ bi lanes of monastery 1, 1A, 1B is really an experience. After the above monasteries, you will see the temple 3. This is the main temple. The architectural beauty is larger than life. Archaeologists say that the temple was constructed two or three times. On excavation, it seems like that the earlier temple was small in size. Later seven temples were built on it. The current temple is bigger in shape. On the basis of architectural style, which includes beautiful stucco images in niches of the temple’s exterior walls, the ancient edifice has been dated by archaeologists to the sixth century CE. Earlier it was allowed to climb up the imposing Temple 3 for a bird’s eye view of the entire ruins but it is not allowed now a days, instead you can see it from a distance. It is always suggested to roam around the temple first. In between temple 13 and 14, the votive stupas are visible. After visiting the temple 14, just cross the road and Monastery 11 is located. This monastery is almost ruined but one interesting fact is that at least 25 stone stands were found inside the monastery. Some of them are still there. It is suggested to visit all the monasteries as the structures of them are unique to each other. In between Monastery 9 and Monastery 8, the road for temple 2 is available. Temple 2 is a must visit ruin. Interesting features of the temple the symmetrically arranged row of two hundreds and eleven sculptured panels over the beautiful base moldings veneered with stone. Twenty panels over the either side of the entrance whereas remaining three sides have fifty seven panels each. Images of gods, goddesses, jatakas, stories, day to day life, human figures, birds, animals, geometrical motif etc. have been magnificently depicted there in. From the architectural point of view the temple was constructed in seventh century. There is an interesting feature in Monastery 6. Two sets of double ovens are visible in the upper courtyard which might have been used for community cooking of for some practical demonstrations to the students. Each of the monasteries is unique to each other. Please be patient and explore at your level best. Nalanda can be reached from Rajgir and Bihar Sharif by Bus or Car. Nearest rail station is Bihar Sharif. But actually Bakhtiyarpur is the popular rail station nearest to Nalanda. Nearest airport is in Patna. No hotel is there in Nalanda. Tourist needs to stay at Rajgir. well written amlan. 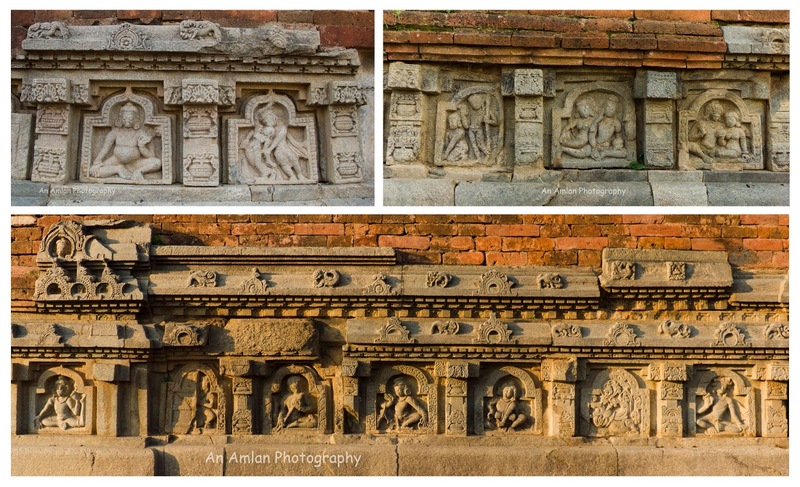 good description of nalanda temples structure and its great impact in indian history. Thank you Avra Da. Ruins of Nalanda University is really a nice place to visit. 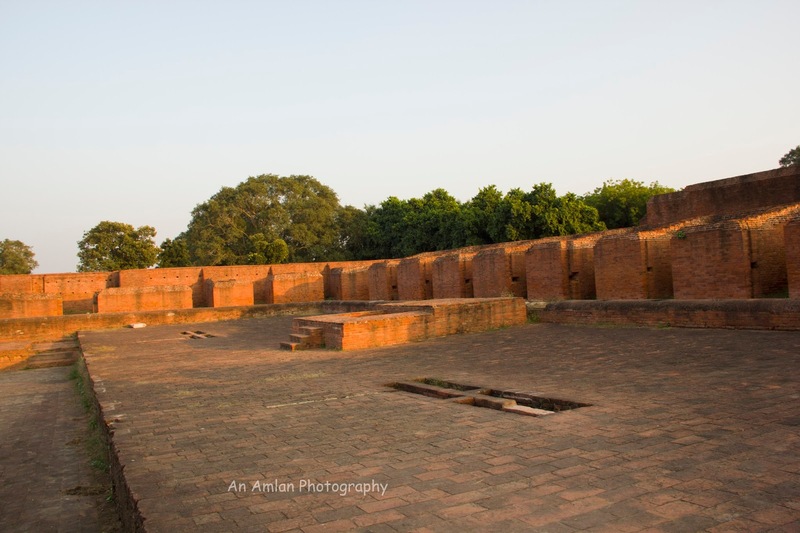 Nalanda University has a significant mark in the Indian History. Though the structure is in ruins still the sculptures and carvings intact are epitome of rich cultural heritage. Loved this post. Thanks for sharing! 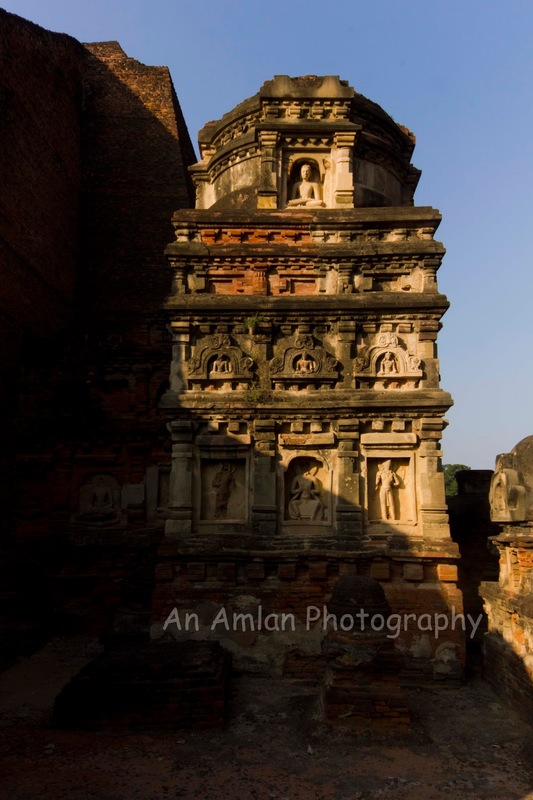 Really a beautiful description of Nalanda with a touch of history and travel tips.